The cauda equina is the grouping of nerve roots that eventually separate off from the spinal cord in the upper lumbar region. These nerve roots provide the core central nervous system functions to the lower body and are some of the most widely implicated causes of lower back pain and sciatica. In fact, more treatment is directed at relieving pain from the lumbar spinal nerve roots than virtually all other spinal structures combined. Understanding the form and function of the cauda equina is important when trying to truly learn about lower back ache syndromes. Many of the painful conditions that occur in the lumbar and lumbosacral areas create pain due to compression or chemical irritation of these vital tissues. Without a proper comprehension of their role in lumbar dorsalgia, patients will simply not be prepared to adequately converse with their care providers regarding many diagnostic topics. Without the ability to communicate and understand your doctor’s diagnostic theories, you are truly disarmed when it comes to protecting yourself against the epidemic occurrence of misdiagnosis and unnecessary treatment. This essay will help to educate you on the facts of the massed nerve root grouping often blamed for creating the type of suffering that might be affecting your back right now. The name of the structure translates to horse’s tail. This is due to its inverted triangular shape and tendency to continue downwards in the spine with the remaining mass of nerves being located on the center line of the structure. The spinal cord is the main conduit of life energy between the brain and the body, carrying motor, sensory and autonomic messages to virtually all of the anatomy. At each level of the backbone, a pair of nerve roots separates off from the spinal cord and exits the vertebral column to create a vast network of peripheral nerve tissues throughout the body. The spinal cord eventually ends in the upper lumbar spine, usually between L1 and L2, but it does not stop abruptly. Instead, it separates into a multitude of individual nerve roots that continue their downward journey to fill all the remaining foraminal spaces in the remainder of the spinal column until the last one exits at the coccyx level. The nerve roots of the cauda equina are just like any other roots in the spine. They are robust and efficient at delivering neurological signals. These tissues are primarily responsible for innervating the buttocks, legs and feet and are therefore often implicated in pain syndromes that occur in these common locations. Structural compression of the nerve roots in the horse’s tail nerve mass is one of the most prevalent theorized causes of lower back and sciatica pain. Since these nerves fill the central vertebral canal space, they are susceptible to impingement from any problem that narrows this primary canal. This includes the obvious example of spinal stenosis, but also encompasses other issues that can reduce central canal patency, such as lumbar scoliosis, lumbar spondylolisthesis, hyperlordosis, hypolordosis, bulging and herniated discs, ligamentous hypertrophy and ossification, as well as other possible sources. Additionally, since each nerve root must also venture out through the neural foramina, there is the possibility that it might be compressed within this opening, as well. Of course, traditional arthritic foraminal stenosis is a major causation, but all of the other conditions listed above can also create singular level compressive neuropathy in the foraminal openings, as well as the addition of facet joint osteophytes that close off the posterior border of the foramina. 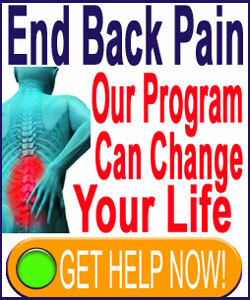 Chemical nerve irritation, most often diagnosed as chemical radiculitis, is also a common cause of cauda equina pain. 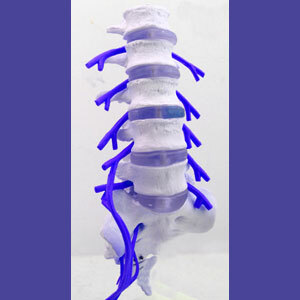 The intervertebral discs in the lumbar region tend to desiccate and herniate quickly and severely. The normal degenerative processes that affect the lumbar spinal discs tend to make them susceptible to annular tears and rupture conditions. When the annulus fibrosus is compromised, material from the inside of the disc can escape and make contact with the nerve roots. While most of the interior of the spinal disc is made up of water and organic gel, the material also contains a protein named tumor necrosis factor alpha. This substance is thought to be a neurological irritant according to many laboratory studies. When the protein contacts the lumbar nerve roots in the central canal or within the foraminal spaces, it may create a painful inflammatory effect. Although the theory of chemical radiculitis remains controversial for good reason, there is enough evidence proving its existence in some patients to explain a great diversity of sciatica expressions that do not involve structural compression of the horse’s tail nerve tissues.